Your professionalism, kindness & caring attitude was amazing and I would recommend your services to everyone in their time of sorrow. 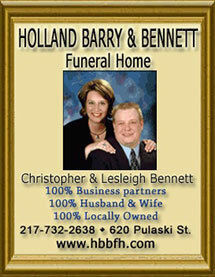 Here at Holland, Barry & Bennett Funeral Home, our business is built on a long-standing tradition of trust. For over 50 years the Holland and Barry name has had an outstanding reputation throughout Logan County and we are proud to continue to uphold that same level of trust as our tradition today.